The OpportunityAre you excited about how great entertainment is created and enthralled by how technology is allowing consumers to discover and enjoy it? Do you want to help tell the story of a company delivering joy to its tens of millions of members all over the world and work closely with the talented and creative people dedicated to innovation and constant improvement? Do you enjoy writing, editing, collaborating, and planning media strategies in a fast-moving environment where responsiveness, clarity and communication are vital? If so, we may have just the opportunity for the right person on our growing communications team. 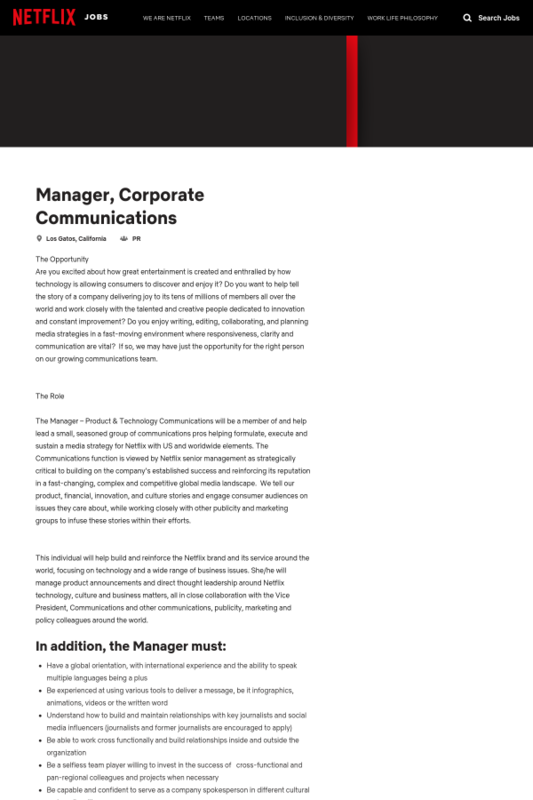 The RoleThe Manager – Product &amp; Technology Communications will be a member of and help lead a small, seasoned group of communications pros helping formulate, execute and sustain a media strategy for Netflix with US and worldwide elements. The Communications function is viewed by Netflix senior management as strategically critical to building on the company’s established success and reinforcing its reputation in a fast-changing, complex and competitive global media landscape. We tell our product, financial, innovation, and culture stories and engage consumer audiences on issues they care about, while working closely with other publicity and marketing groups to infuse these stories within their efforts. This individual will help build and reinforce the Netflix brand and its service around the world, focusing on technology and a wide range of business issues. She/he will manage product announcements and direct thought leadership around Netflix technology, culture and business matters, all in close collaboration with the Vice President, Communications and other communications, publicity, marketing and policy colleagues around the world.